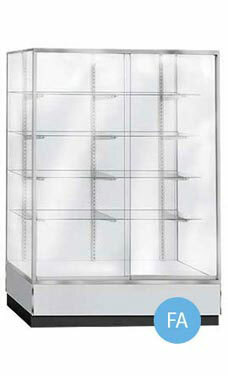 The gray metal framed wall unit display case is a great way to highlight your finest merchandise. By keeping your showroom floor organized with matching display cases, it's easy to attract customers. The upright glass display case possesses a large 60" vertical glass display area, 12" H base deck, and satin finish clear anodized aluminum frame extrusions. It's elegance and dependability will provide attractive display presentations for years to come. Featuring 4 adjustable rows with 1/4" glass shelves 12" deep and 1/4" glass sliding door, the wall unit will not only highlight your most precious merchandise, but it makes it very easy on the retailer to restock purchased inventory. Other features include a bright white back and deck, heavy duty steel standards and brackets, brushed anodized aluminum door track, gray melamine exterior laminate surfaces, recessed black kick-plate, and a 3/4" slab end construction. Optional light kit and lock available but sold separately. Overall Size: 72"H x 20"D x 70"L. Wood crating for secure shipping is included in the price of the case. Ready to ship.